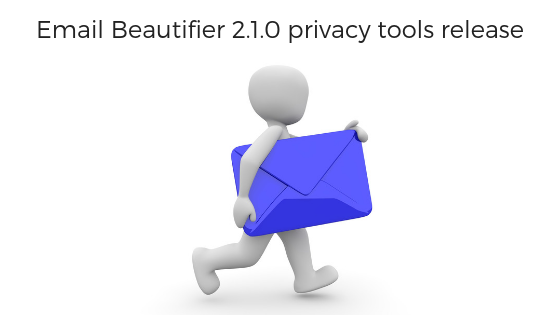 We are happy to announce that Email Beautifier is getting another release with v2.1.0 which primarily adds support for Joomla 3.9.x privacy tools suite in addition to the few enhancements and bug fixes. Read on for details related to the plugins and for the detailed changelog. Action Log plugin for Email Beautifier logs actions related to the email template. Site administrator can review the user actions and adjust the plugin settings according to his preferences. This plugin is by default disabled on fresh installations, site admin can enable it if needed. This plugin allows site administrators to add more replacement tags to existing email template. We have introduced 3 new tags in this release - [NAME], [USERNAME] and [EMAIL]. Site integrators can create new plugin if needed to add more replacements for subject and body of outgoing mails by referring to this plugin. In addition to these two features, we have made changes to logging, so that new logs are written into the logs folder, as configured in Joomla’s global configuration, in a file com_emailbeautifier.log.php instead of logging into component’s folder. Email Beautifier 1.6.1 Critical Release!